In the most general terms, growth stocks are those with growing positive attributes – like price, sales, earnings, profits, and return on equity. Value stocks, on the other hand, are stocks that are underpriced when compared to some measure of their relative value – like price to earnings, price to book, and dividend yield. Thus growth stocks trade at higher prices relative to various fundamental measures of their value because (at least in theory) the market is pricing in the potential for future earnings growth. Over relatively long periods of time, each of these investing classes can and do outperform the other. For example, growth investing dominated the 1990s while value investing has outperformed since. But value wins over the long haul. To be fair, we are not talking about exact categorizations here. As Warren Buffett emphasized in his 2000 letter to shareholders, those “who glibly refer to growth and value styles as contrasting approaches to investment are displaying their ignorance, not their sophistication.” Buffett would have investors rely on a company’s intrinsic value to determine whether or not it is fairly priced. That measure is largely determined by value considerations, but also includes growth characteristics in the overall mix. However, whether cash flow (for example) is growing at any particular time doesn’t really matter; what matters are the totality of future cash flows. Obviously, this process is very difficult and highly subjective. The bottom line is that we should value businesses by estimating how much cash an investor can expect to take out of them over their remaining lives. And those considerations are largely value-oriented. 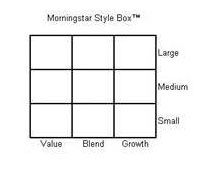 These broad distinctions have led to the famous Morningstar” style box” (shown below). Morningstar’s value calculus is one-half price/projected-earnings ratio (forward P/E) with the other half evenly divided among price/book ratio, price/sales, price/cash flow, and dividend yield. On the other hand, its growth calculus is one-half long-term projected earnings growth with the other half evenly divided among historical earnings growth, sales growth, cash flow growth, and book value growth. Morningstar designates the largest 250 U.S. stocks (based upon market capitalization) as large cap, the next largest 750 stocks as mid cap, and the remaining stocks as small cap. Others think of large cap as companies with a market cap in excess of $10 billion, mid cap as $2-10 billion, and small as under $2 billion. That’s how these categories are typically delineated. Since, in general, nobody leaves a $100 bill lying on the sidewalk unclaimed, there is good reason to be skeptical of any proposed winning strategy, including value. It is axiomatic in the investment universe that good trades get copied to death, crowding out excess returns. However, value has significantly outperformed growth over the long haul in a persistent way. For example, the Russell 3000 Value Index has returned 8.87 percent annualized from its inception to date while the Russell 3000 Growth Index has returned 7.08 percent annualized over the same period. That outperformance exists in each and every category over the long-term. A comprehensive listing is provided by the addendum below. Since value outperformance has persisted, the obvious and necessary question is: “Why?” One traditional answer is that value stocks are riskier in some way. At market extremes in particular, value stocks can get beaten up pretty badly, so this risk hypothesis isn’t totally nuts. But since growth investing projects increasing growth into an unknown future, it seems to me that growth probably bears more risk in the aggregate. In any event, there is no clear data-driven basis to conclude that value is riskier. Moreover, since low volatility and low beta strategies have outperformed persistently, the intuitive idea that higher risk correlates to higher return does not necessarily follow either. I think the better answer lies in our behavioral and cognitive biases. Jack Bogle (among others) has emphasized that while value beats growth persistently on an index basis, when the data examined is real mutual fund returns, the advantage tends to disappear. In other words, we screw things up. As Bill Simmons recently noted in the context of NBA player evaluation: “Fans always gravitate toward unlimited potential over known commodities.” And that’s why — in a nutshell — the value premium persists. Baseball presents a similar phenomenon, though it clearly reaches into the management suite there. Major League GMs once got great value by trading for minor league prospects. But the landscape has changed such that prospects now tend to be over-valued. Accordingly, teams part with solid major-leaguers in exchange for untested prospects with a slightly higher ceiling potential to their detriment. As Rany Jazayerli has shown (in The MLB Prospect Bubble): “Increasingly, teams have decided that they’d rather bet on that ceiling than take the guaranteed return.” Once again, value beats growth, but we refuse to act on it. Here’s my explanation/hypothesis why that is so (with illustrative over-the-top videos). We choose ideology over facts and stories over data. We all develop ideologies as intellectual strategies for categorizing and navigating the world. Psychological research increasingly shows that these ideologies reflect our unconscious goals and motivations rather than reflecting anything like independent and unbiased thinking. This reality fits conveniently together with the narrative fallacy, which is our tendency to look backward and construct a story that explains what happened along with what caused it to happen. We all like to think that our outlooks and decision-making are rationally based processes — that we examine the evidence and only after careful evaluation come to a reasoned conclusion as to what the evidence suggests or shows. But we don’t. Rather, we spend our time searching for that which we can exploit to support our pre-conceived commitments, which act as pre-packaged means of interpreting the world. We like to think we’re judges of a sort, carefully weighing the alternatives and possibilities before reaching a just and true verdict. Instead, we’re much more like lawyers, looking for anything – true or not – that we think might help to make our case and looking for ways to suppress that which hurts it. We inherently prefer words to numbers and narrative to data — often to the immense detriment of our understanding. Indeed, we know from neurobiology that when presented with evidence that our worldviews are patently false, we tend to refuse to engage our prefrontal cortex, the very part of the brain we need most to make sense of the new. This aspect of our make-up is potentially damaging to every decision we make, and especially in investing. It’s why we concoct silly conspiracy theories. We see what we want to see and act accordingly. We love status. Our preferred stories cast us as heroes – figuring out what lesser mortals cannot. Simon Lack, a hedge fund insider from his long tenure at JPMorgan Chase, raised a ruckus last year with his book, The Hedge Fund Mirage, in which he argued that the hedge fund industry as a whole lost more money in 2008 than it had made in the previous 10 years. Even worse, “[i]f all the money that’s ever been invested in hedge funds had been put in Treasury bills instead, the results would have been twice as good,” especially since nearly all the hedge funds’ gains had gone to managers rather than clients. In 2012, the HFRX Global Hedge Fund Index, reflective of industry returns, gained just 3.5 percent and has returned just 1.7 percent over the past 10 years. Thus the S&P 500 has outperformed the HFRX for ten straight years, with the exception of 2008 when both fell sharply. More significantly, a standard 60/40 portfolio has delivered returns of more than 90 percent over the past decade, compared with a meager 17 percent after fees for hedge funds. Despite these facts, hedge funds continue to sell big. I think it’s because of status. Status also explains why the lowest-ranked equity slices of the most toxic CDOs during the mortgage crisis were said not to go to institutions, but to “some high-net-worth clients.” We tend to want what the richest and the best have to establish our standing high up in the pecking order. Mundane facts are singularly unsatisfying. We’re overconfident about our skills and overly optimistic about expected results. We insist that we are anything but average, facts notwithstanding. We suffer from a well-established bias in which our subjective confidence in our judgments is reliably greater than their objective accuracy. Consider Wing Chau, the hapless fund manager profiled by Michael Lewis in The Big Short. According to Lewis, Chau controlled roughly $15 billion in toxic subprime CDOs and thanked Steve Eisman for shorting that market because his doing so provided him with more garbage to buy. We all know how that turned out. But it’s also true that Chau was hardly alone. As he stressed: “Many investors that chose to purchase the bonds [CDOs] were among the most sophisticated in the world, including the proprietary trading desks of investment banks as well as large insurance companies.” He insists that he wasn’t as foolish as he seems since “more than 80 firms” participated in that market. We wear rose-colored glasses – that’s why fully 94% of college professors believe they have above-average teaching skills (anyone who has gone to college will no doubt disagree with that) and 80% of drivers say that their driving skills are above average. Thus sitting in class or driving on the freeway provide obvious reasons why we fail to act upon the value premium. We like to win and win big. The 1930 classic, Watch Your Margin, insists that people don’t invest just to make money. They also play the markets for the thrill – especially the thrill of getting something for nothing. If we invest consistent with the “tried and true,” we aren’t winning. We want to win and win big. We don’t want the mundane. We don’t want average. We want flow. That’s why (for example), final eBay bids tend to exceed available fixed price offerings and, surprisingly, the most experienced participants are most likely to bid sub-optimally. The effects of our biases are amplified by our participation in the markets. We want to roll-the-dice and win big. How do you think those lavish casinos get built, anyway? We routinely exaggerate our ability to shape the future. This is what Nobel laureate Daniel Kahneman takes care to describe as the “planning fallacy.” It is our tendency to underestimate the time, costs, and risks of future actions and at the same time overestimate the benefits thereof. It’s at least partly why we underestimate bad results. It’s why we think it won’t take us as long to accomplish something as it does. It’s why projects tend to cost more than we expect. It’s why the results we achieve aren’t as good as we expect. And I think it’s why we ignore simple investment truths to chase nonsense. We may “know” that a bird in the hand is worth two in the bush, but we still tend to go running into the bushes anyway. ADDENDUM: Other value/growth comparisons (from their inception to date): Russell 1000 Value/Growth 9.08/8.06; Russell 2000 Value/Growth 10.50/6.74; Russell 2500 Value/Growth 5.91/5.84; Russell Asia ex-Japan Value/Growth 5.28/2.09; Russell Asia Pacific Value/Growth 4.14/1.73; Russell BRIC Value/Growth 11.67/7.19; Russell Developed Europe ex-UK Value/Growth 7.35/6.55; Russell Developed Europe Value/Growth 7.08/6.26; Russell Developed Eurozone Value/Growth 6.78/6.24; Russell Developed ex-Japan Value/Growth 7.75/5.76; Russell Developed ex-North America Value/Growth 5.87/4.55; Russell Developed ex-U.S. Value/Growth 6.23/4.48; Russell Developed ex-U.S. Large Cap Value/Growth 6.15/4.62; Russell Developed ex-U.S. Small Cap Value/Growth 7.15/3.83; Russell Developed Value/Growth 6.98/5.07; Russell Developed Large Cap Value/Growth 6.91/5.20; Russell Developed Pacific Basin Value/Growth 3.63/1.39; Russell Developed Small Cap Value/Growth 8.07/4.19; Russell Emerging Asia Value/Growth 4.17/1.02; Russell Emerging EMEA Value/Growth 10.74/5.46; Russell Emerging Europe Value/Growth 12.54/7.66; Russell Emerging Markets Value/Growth 9.12/3.02; Russell Emerging Markets Large Cap Value/Growth 9.69/2.99; Russell Emerging Markets Small Cap Value/Growth 8.13/3.26; Russell Europe ex-UK Value/Growth 7.49/6.26; Russell Europe Value/Growth 7.17/6.08; Russell Eurozone Value/Growth 6.76/6.21; Russell Global 1000 Value/Growth 3.35/2.79; Russell Global 2000 Value/Growth 6.78/4.85; Russell Global 2000 ex-U.S. Value/Growth 8.27/6.17; Russell Global 3000 ex-U.S. Value/Growth 4.17/4.00; Russell Global ex-Japan Value/Growth 7.90/5.71; Russell Global ex-North America Value/Growth 6.32/4.58; Russell Global ex-U.S. ex-Japan Value/Growth 8.12/5.92; Russell Global ex-U.S. Value/Growth 6.62/4.54; Russell Global ex-U.S. Large Cap Value/Growth 6.53/4.66; Russell Global ex-U.S. Small Cap Value/Growth 7.39/4.01; Russell Global ex-UK Value/Growth 7.22/5.01; Russell Global Value/Growth 7.16/5.06; Russell Global Large Cap Value/Growth 7.07/5.19; Russell Global Small Cap Value/Growth 8.18/4.29; Russell Global SMID Value/Growth 8.77/6.10; Russell Greater China Value/Growth 4.64/2.74; Russell Latin America Value/Growth 14.69/10.57; Russell Microcap Value/Growth 6.83/1.61; Russell Midcap Value/Growth 11.00/8.68; Russell Small Cap Completeness Value/Growth 6.66/3.89; Russell Top 200 Value 7.97/6.96. Similar measures find the same thing. The S&P GIVI (Global Intrinsic Value Index) is a rules-based, global equity strategy index designed to capture the low-volatility and value anomalies and has outperformed across each of the nine regions studied: global, developed markets, emerging markets, U.S., Europe, U.K., Japan, emerging Asia Pacific, and Pan Asia ex-Japan, Australia and New Zealand.